Some of the more common questions I get regarding footwear is whether an individual has enough arch support or how much stability a shoe has. While stability can come from a variety of places, the footwear industry generally describes stability by how much denser medial midsole material there is in the shoe. This is also called posting and most companies add stability in the heel and midfoot as that is the only place they seem to think stability is needed to control pronation. Pronation is generally described as the collapse of the medial longitudinal arch. The problem with that thinking is that the forefoot is an important component of the medial longitudinal arch. There are three arches of the foot. There is a medial longitudinal arch, transverse metatarsal arch (at the base of the metatarsals) and a lateral longitudinal arch. The medial longitudinal arch is what is most commonly discussed with regards to pronation. While the midfoot is stabilized a great deal by the posterior tibialis (more so than the intrinsic foot muscles), the forefoot is heavily influenced and stabilized by fibularis longus, abductor hallucis and some of the intrinsic foot muscles. If these muscles are weak, there can be some issues as the biomechanics of the joints can be compromised. They are very important for stabilizing the first metatarsal of the foot, which makes up the front half of the medial longitudinal arch. The position of this bone affects how the great toe functions, which in turn affects how the forefoot rocker works. During the gait cycle, the forefoot is extremely important for the propulsive or toe-off phases of gait. As you transition from foot flat or the midstance of gait to the forefoot, the first metatarsal needs to stay in a plantarflexed position. That means that front half needs to be able to stay down so the first MTP joint (metatarsophalangeal joint) maintains contact with the ground. When the first metatarsal is plantarflexed, the first MTP joint functions as it should, meaning that the first toe is able to dorsiflex or extend at least 60 degrees for normal gait (+70 degrees from some sources for running). The extension of the great toe engages the plantar fascia and the Windlass Mechanism, which acts to stabilize the entire foot. 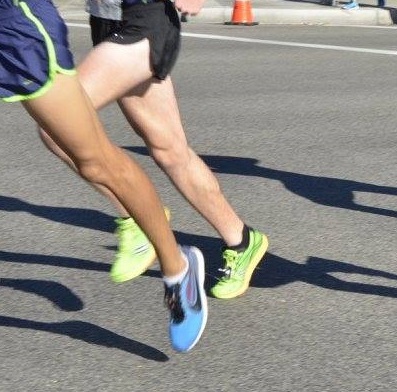 This provides a stable base at both the forefoot and the rest of the foot for a powerful toe-off during the terminal stance phase of gait (aka propulsive) over the first MTP joint. This is also called the forefoot rocker and is extremely important for maintaining forward moment during gait as well as properly utilizing the calf muscles. With instabilities in the forefoot, you may see a collapse of the various arches. As pronation is a triplanar motion, meaning that it is comprised of three motions including dorsiflexion, abduction and eversion, the first metatarsal will dorsiflex or raise up during a collapse. When the first metatarsal dorsiflexes as the forefoot collapses, the first MTP joint becomes limited due to pulling on the plantarfascia and other ligamentous structures. Thus, the first toe is limited in extension or dorsiflexion making it very difficult to roll off that important joint, comprising the forefoot rocker. The human body will attempt to compensate around this in many ways. Many people will avoid the first MTP joint, instead rolling off the lateral metatarsal joints. This places a great deal of stress on the 4th and 5th MTP joints, which are prone to stress fractures due to the smaller shape compared to the medial forefoot. The more common compensation is to evert the foot to roll off the medial side of the first toe, placing excessive force on the medial side of the first MTP joint. This causes some problems. This compensation further promotes collapse of the medial longitudinal arch as it changes to progression angle of the foot, causing an increase in eversion. Rolling off the medial aspect of the first MTP joint also pushes the first toe laterally, since the body will compensate for a lack of extension motion in another plane of motion, in this case adduction of the hallux (this eventually leads to hallux valgus or bunions). Finally, the calf muscles may not engage as well due to the lack of a fully functional forefoot rocker, which may limit the maintenance of forward moment and cause further compensations at the knee, hip, pelvis and even low back. The first MTP and first metatarsal are stabilized by the fibularis longus and abductor hallucis and should be strengthened to try to naturally maintain and stabilize the normal function of these joints and structures. I will have a full post on this in the future. From a footwear standpoint, there is potential to assist these muscles and joints but most footwear companies do not typically offer stability in the forefoot to help maintain these important functions. As mentioned earlier, most footwear companies will put posting or firmer midsole material at the medial heel and midfoot. The idea is to slow down pronation in those areas. The problem is that you then leave the forefoot naked and without assistance. As with other areas of the foot you can stabilize the forefoot with medial posting, somewhat through medial sole flare and to a degree through the proper execution of toe spring. The full length stability is one of the few ways companies provide stability in the forefoot as seen in the Nike Odyssey 2. Forefoot posting is a rare feature in the running shoe industry but there are a few shoes out there with this feature. The first shoes I saw with this were the early Adidas Adizero Mana 1 (with a small heel and forefoot posts) as well as the New Balance 801s in the early 2000s. There were several Asics Japan racing shoes that had forefoot posting, but those seem to have died out for the most part. The Newton Distance S had a forefoot post but that shoe has been discontinued for some time. The current shoes that have some kind of stability up front are mostly those that posting that extends the full length of the shoe. This includes the Nike Odyssey, the Skechers GOrun Forza, the Asics GT-3000 series, the New Balance Vongo, the Hoka Gaviota and the Hoka Arahi. Although I have not tested it myself, the Adidas Tempo 9 is supposed to have forefoot only stability per Sam Winebaum at RoadTrailRun. So this is a somewhat rare feature in the footwear industry. It may not be as rare with a certain shoe coming out from Skechers that Sam Winebaum has a great video introduction of HERE (coming early 2018). 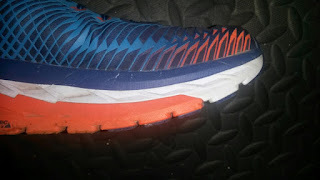 This shoe executes forefoot stability very well and I am looking forward to discussing it more in the future. Another way to try to stabilize the forefoot is through forefoot medial sole flare. I have discussed sole flare previously HERE, but again the medial protrusion of the sole may serve to slow the inward roll of the foot to some degree. This is a increasingly common feature of both (supposedly) stability and neutral shoes. 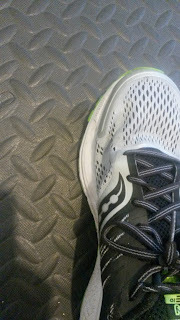 Saucony is one company that tends to do this frequently and this is something you will typically see more in trainers. Racing shoes do not typically have this as companies are trying to save as much weight as possible, so the soles will tend to be narrower. Toe Spring and extended stability into the forefoot as seen with the Hoka Arahi. Finally we have toe spring, which may be somewhat surprising. I have discussed toe spring previously as well (HERE) and the point of it is to create an artificial forefoot rocker. For those that have lost the mobility of their first MTP joint, toe spring is great to help the foot roll over the forefoot without excessive pressure up front. Hoka tends to do this very well, but I prefer what they call the Late Stage Metarocker, which can be found in the Gaviota and Arahi. This appears to save the toe spring until you hit the metatarsal joints, may be more natural. I have had problems with many Hoka shoes due to the extensive early toe spring, but the more natural placement late toward the toes may engage the foot better the shoes that have earlier spring. This will create a certain degree of stability by helping to maintain forward momentum of the foot rather than allowing it to deviate into other planes of motion. This mimics the extension of the first toe and to some degree the plantarflexion of the first ray that is normally needed for forefoot stability. I tend to prefer the upward curve of the sole under the toes be less than at the outsole. Excessive toe spring can also create problems if stiff toes are held in extension as that may place excessive strain on the plantar fascia. So make sure the shoes keep your foot in a more neutral position than what the spring does (this was a problem in the early versions of the Adidas Boston Boost). Terminal stance phase of gait. So while forefoot stability is not commonly utilized in running shoes, this should shed some light not only on some shoes that may help with this but also some other ways you can stabilize this area. As I mentioned earlier, I will have a post on how to strengthen the muscles responsible for stabilizing the forefoot as that should be your priority. However, people may have biomechanical issues that may be assisted with some of these shoe attributes. I need to emphasize that posting, sole flare, toe spring all assist the foot. A shoe should not force the foot to do things as that may cause problems. Hopefully as footwear companies began to expand out their understanding of stabilizing the foot, we will see more shoes with stability in the forefoot. 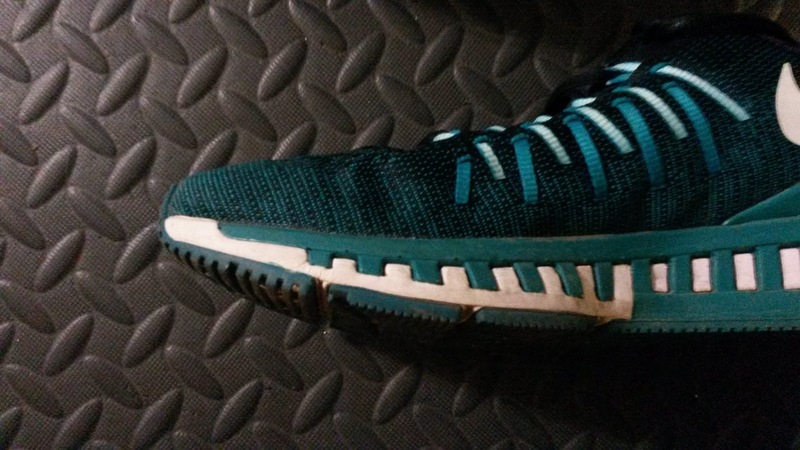 I am glad to see less shoes with extreme stability as light stability is usually what most people need (with those with specific biomechanical or genetic based issues being an exception) in addition to extensive strength and mobility work. However, given the forefoot is a extremely important part of the foot for both stability and propulsion, a wider range of shoes with stability there can only help.